Need something to bring to a backyard BBQ or snack on during the day? Try this quick 4 ingredient fruit salad with a secret. You might be thinking "really, banana pudding mix?" Trust me it's amazing. 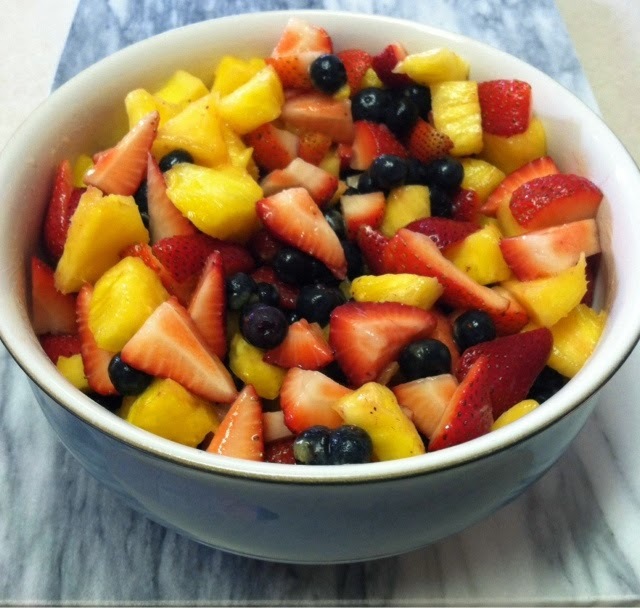 1) Cut up all fruit and place in a large bowl. 2) Sprinkle 1 tablespoon of the dry pudding mix on the fruit. 3) Mix the powder and fruit together. The juices from the fruit will create a dressing with the mix. 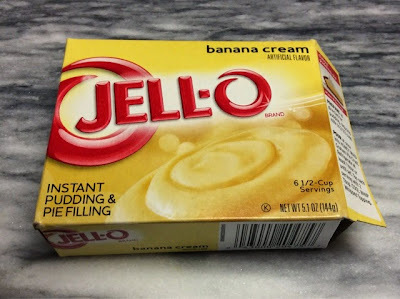 Add more pudding mix if you want an extra kick of flavor. How easy is this? My husband and I enjoyed this salad with our Sunday night dinner. It was delicious and refreshing. 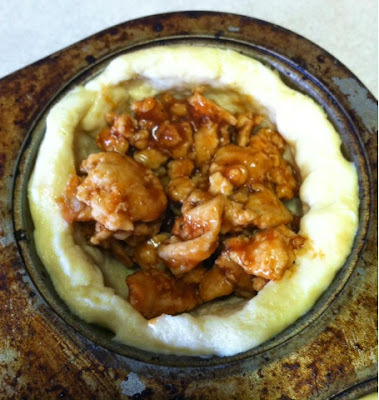 When I saw Pillsbury BBQ Cups on Tori's Blog, the sTORIbook, I knew I had to make them for dinner. They are quick, easy and husband approved. The only changes I made was using ground turkey instead of ground beef and adding a little more BBQ sauce. Read the original recipe here. 2) Each cup uses half a biscuit. 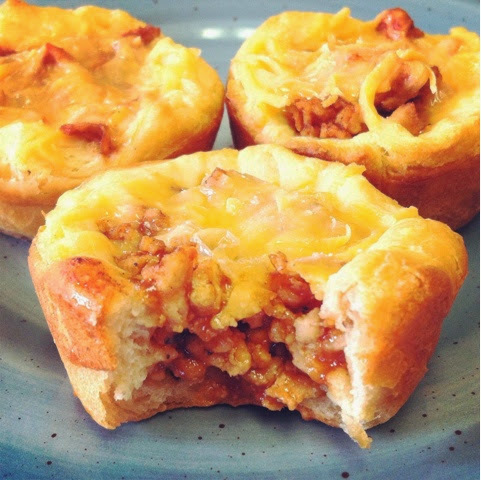 Place a half of a biscuit in each cup and press the dough up the sides of a cup cake pan. Excuse my well seasoned pan. 3) Brown the turkey meat in a skillet on the stove. Mix in BBQ sauce. 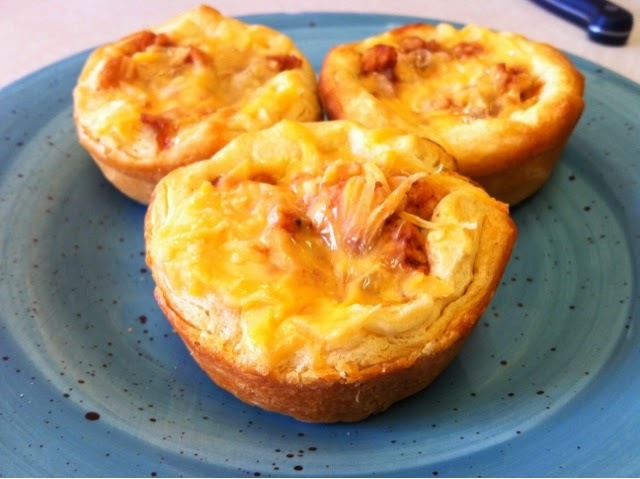 4) Sprinkle cheddar cheese on top of each cup. 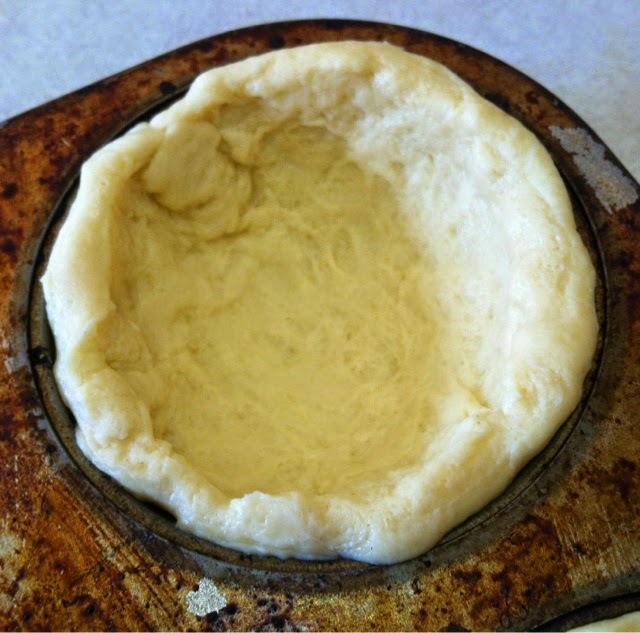 5) Bake for 13-15 mins. 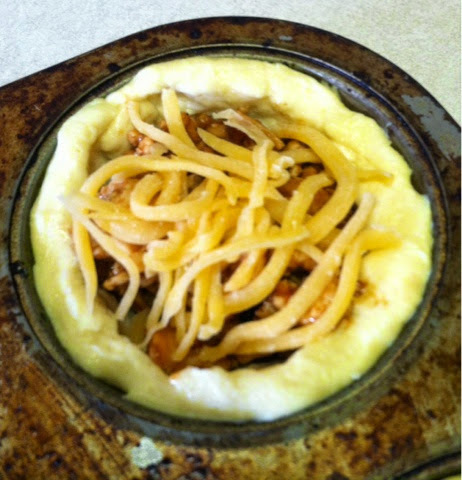 Cheese should be melted and the biscuit will be golden brown. I had Samantha from Green Eggs and Sam, Jordan from Elizabeth Grace Blog and Ashlei over this week for dinner but didn't have much time to cook by the time I got off work. I wanted to serve a quick but delicious dessert. Crock pot cobbler is so easy and can be made with any flavor of fruit! 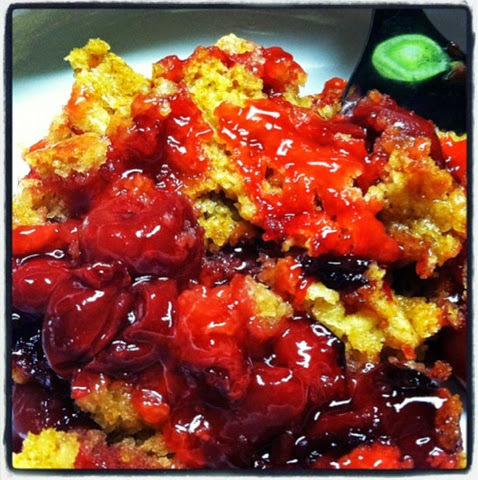 Check out the cherry cobbler I made last year. Pour cake mix into a large bowl. 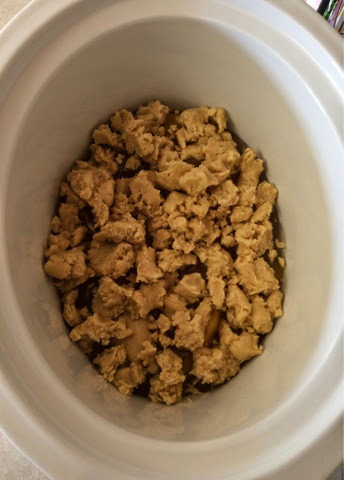 Mix in butter and vanilla. Stir well. 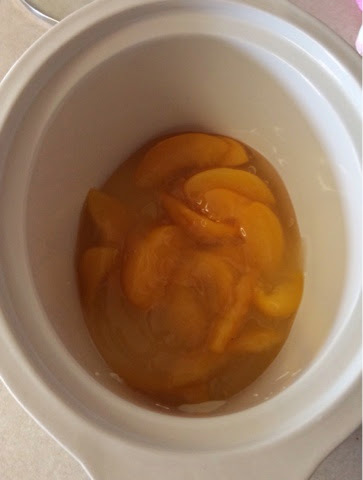 Pour both cans of peaches into your crock pot OR only pour in one can if making a half batch like I did. Crumble dough mixture with your hands over peaches. Use all the dough if making a full batch with both cans of peaches. 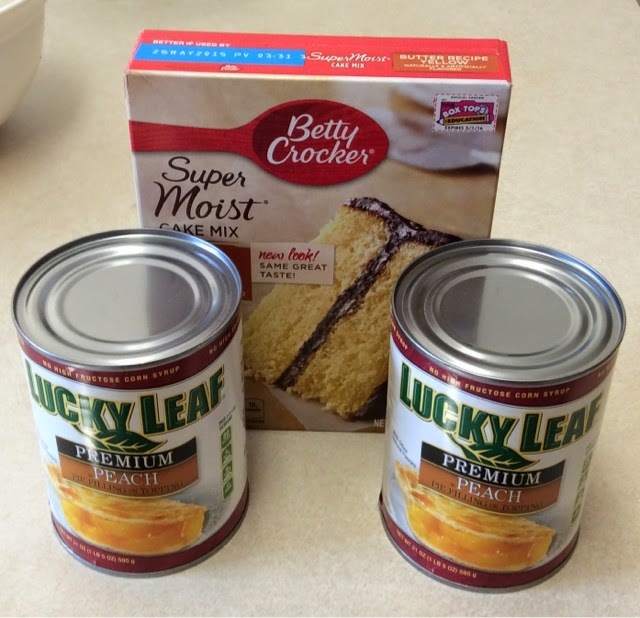 Use half the dough mixture if making a half batch with one can of peaches. Sprinkle walnuts on top. Cook on low for 3-4 hours or on high for 2-2 1/2 hours. Dough will not rise like cake My half batch of cobbler was done perfectly in exactly 2 hours set on high. 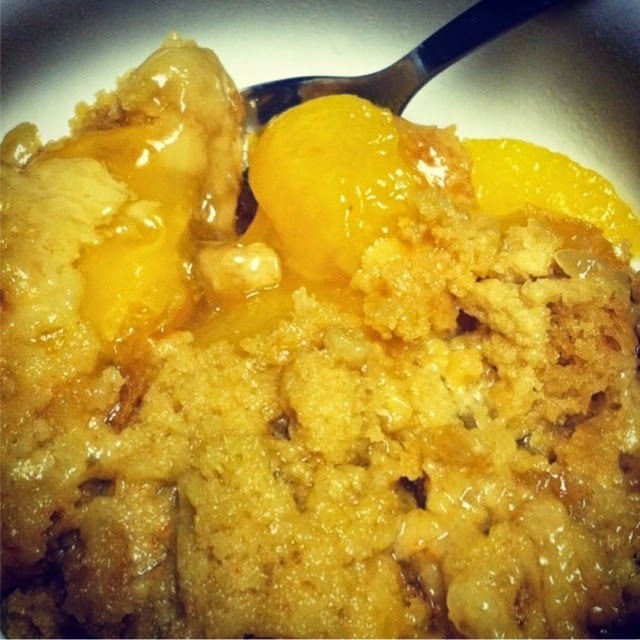 Cobbler is done when the edges are crisp and the dough is golden brown. Enjoy! Serve with vanilla ice cream.